NLP Glossary - Terms and meanings - The Tad James Co.
‘As-If’’ Frame This is “acting as if” something were true. I.E. : Pretending that you are competent at something that you are not, like tennis. The idea is that the pretense will increase your capability. Analogue (As opposed to Digital) Analogue distinctions have discrete variations, as in an analogue watch. 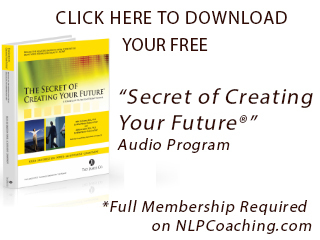 Anchoring The NLP Technique whereby a stimulus is linked to a response. An Anchor can be intentional or naturally occurring. Associated It deals with your relationship to an experience. In a memory, for example, you are associated when you are looking through your own eyes, and experiencing the auditory and kinesthetics at the same time. Backtrack To go back and summarize or review what was previously covered, as in a meeting. Behavior Any external verifiable activity we engage in. Beliefs Generalizations we make about the world and our opinions about it. Calibration Usually involves the comparison between two different sets of non-verbal cues (external verifiable behavior). It allows us to distinguish another’s state through non-verbal cues. Chunking As in thinking – moving up or down a logical level. Chunking up is moving up to a higher, more abstract level that includes the lower level. Chunking down is moving to a level, which is more specific. Congruence When the behavior (external verifiable) matches the words the person says. Conscious That of which we are currently aware. Contrastive Analysis This is a SubModality process of analyzing two sets of SubModalities to discover the Drivers, I.E. : What makes them different. For example the difference between Ice Cream (which the client likes) and Yogurt (which the client does not like) are based on SubModality distinctions. Crossover Mirroring Matching a person’s external behavior with a different movement, E.G. : Moving your finger to match the client’s breathing. Deep Structure The unconscious basis for the surface structure of a statement. Much of the deep structure is out of awareness. Digital Digital (As opposed to Analogue) Digital distinctions have distinct variations of meaning as in a Digital watch, or an “On/Off” switch. Dissociated It deals with your relationship to an experience. In a memory, for example, you are dissociated when you are not looking through your own eyes, and you see your body in the picture. Drivers In SubModalities, drivers are the difference that makes the difference. Discovered through the process of Contrastive Analysis, Drivers are the critical SubModalities, and when changed tend to carry the other SubModalities with them. Ecology In NLP, Ecology is the study of consequences. We are interested in the results of any change that occurs. It is often useful to look at the ecology in making any change as to the consequences for self, family (or business), society and planet. Elicitation Inducing a state in a client, or gathering information by asking questions or observing the client’s behavior. Epistemology The study of knowledge or how we know what we know. First Position This is one of the Perceptual Positions. First Position is when you are in touch with only your own inner Model of the World. Frame A frame sets a context, which is a way we can make a distinction about something, as in As-If Frame, Backtrack Frame, Outcome Frame. Future Pace Mentally rehearsing a future result to install a recovery strategy so that the desired outcome occurs. Incongruence When the behavior (external verifiable) does not match the words the person says. Intent The outcome of a behavior. Internal Representations The content of our thinking which includes Pictures, Sounds, Feelings, Tastes, Smells, and Self Talk. Kinesthetic This sense includes feelings, and sensations. Leading After pacing (matching or mirroring) a client’s behavior, leading involves changing your behavior so that the other person follows your behaviors. Lead System This is where we go to access information. The Lead System is discovered by watching Eye Accessing Cues. Metaphor A story (analogy or figure of speech) told with a purpose, which allows us to bypass the conscious resistance of the client and to have the client make connections at a deeper level. Milton Model The Milton Model has the opposite intent of the Meta Model (Trance), and is derived from the language patterns of Milton Erickson. The Milton Model is a series of abstract language patterns which are ambiguous so as to match our client’s experience and assist her in accessing unconscious resources. Mismatching This generally relates to contradictory behavior or words, and is one of the Meta Programs. Modal Operator Modal Operator of Necessity relates to words, which form the rules in our lives (should, must, have to, etc.). Modal Operator of Possibility relates to words that denote that which is considered possible (can, cannot, etc.). Model In NLP, a Model is a description of a concept or a behavior, which includes the Strategies, Filter Patterns and Physiology so as to be able to be adopted easily. Modeling Modeling is the process by which all of NLP was created. In Modeling we elicit the Strategies, Filter Patterns (Beliefs and Values) and Physiology that allow someone to produce a certain behavior. Then we codify these in a series of steps designed to make the behavior easy to reproduce. Model of the World A person’s values, beliefs and attitudes that relate to and create his or her own world. Neuro Linguistic Programming NLP is the study of excellence, which describes how our thinking produces our behavior, and allows us to model the excellence and to reproduce that behavior. Olfactory The sense of smell. Pacing Pacing is matching or mirroring another person’s external behavior so as to gain rapport. Perceptual Position Describes our point of view in a specific situation: First Position is our own point of view. Second Position is usually someone else’s point of view. Third position is the point of view of a dissociated observer. Preferred Rep System This is the representational system that someone most often uses to think, and to organize his or her experiences. Presuppositions of NLP Assumptions or convenient beliefs, which are not necessarily “true,” but which if accepted and believed will change our thinking and improve our results as an NLP Practitioner. Rapport The process of Matching or Mirroring someone so that they accept, uncritically, the suggestions you give them. (Originally in Hypnosis ‘Rapport’ had a different meaning, which was, a state where the subject in Hypnosis sees, hears only the Hypnotherapist.) This is not the meaning in NLP where it relates to establishing trust and rapport between two people. Representation A thought in the mind which can be comprised of Visual, Auditory, Kinesthetic, Olfactory (smell), Gustatory (taste), and Auditory Digital (Self Talk). Representational System One of the six things you can do in your mind: Visual, Auditory, Kinesthetic, Olfactory (smell), Gustatory (taste), and Auditory Digital (Self Talk). Resources Resources are the means to create change within oneself or to accomplish an outcome. Resources may include certain states, adopting specific physiology, new strategies, beliefs, values or attitudes, even specific behavior. Sensory-Based Description Is describing someone’s verifiable external behavior in a way that does not include any evaluations, but in a way that just relates the specific physiology. E.G. : “She is happy,” is (in NLP terminology) an hallucination. A sensory based description would be, her lips are curved upward at the end, and her face is symmetrical. State Relates to our internal emotional condition. I.E. : A happy state, a sad state, a motivated state, etc. In NLP we believe that the state determines our results, and so we are careful to be in states of excellence. Strategy A specific sequence of internal and external representations that leads to a particular outcome. SubModalities These are distinctions (or subsets) that are part of each representational system that encode and give meaning to our experiences. E.G. : A picture may be in Black & White or Color, may be a Movie or a Still, may be focused or defocused – these are visual SubModalities. Time Line Our Time Line is the way we store our memories of the past, the present and the future. Trance Any altered state. 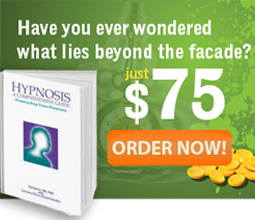 In Hypnosis it is usually characterized by inward one-pointed focus. Unconscious That of which you are not conscious, or which is out of awareness. Unconscious Mind The part of your mind that you are not conscious of … right now. Uptime A state where the attention is focused on the outside (as opposed to Downtime where attention is focused inward). Vestibular System Having to do with the sense of balance. Visual Having to do with the sense of sight. Visual Squash (Now called Parts Integration.) An NLP technique which allows us to integrate parts at the unconscious level by assisting each one to traverse logical levels (by chunking up) and to go beyond the boundaries of each to find a higher level of wholeness. Well Formedness Along with the Keys to an Achievable Outcome (see page10, NLP Practitioner Training Manual), the Well Formedness Conditions (see page 11, NLP Practitioner Training Manual) allow us to specify outcomes that are more achievable, because the language conforms to certain rules.